The site context and desire lines suggested a triangular plan with the further need to address visitor entry, suggested an angled orientation for the main entrance further re-enforced by the need for the supervisor to have oversight of the water. This angular geometry has been utilised to define and separate the major facilities; being administration, marina facilities, and public toilets. The roof form defines the main triangular geometry to form a 'sail' shape, which works with the roof pitch to create a higher roof at the main entrance that reduces to the north, further defining the hierarchy of functions. The geometry of the walls follows a differing alignment to that of the roof, creating overhanging canopies for each of the three entrance points. Full height curtain walling is used for the south-west facing wall of the administrative office to enhance the presence of this facade. 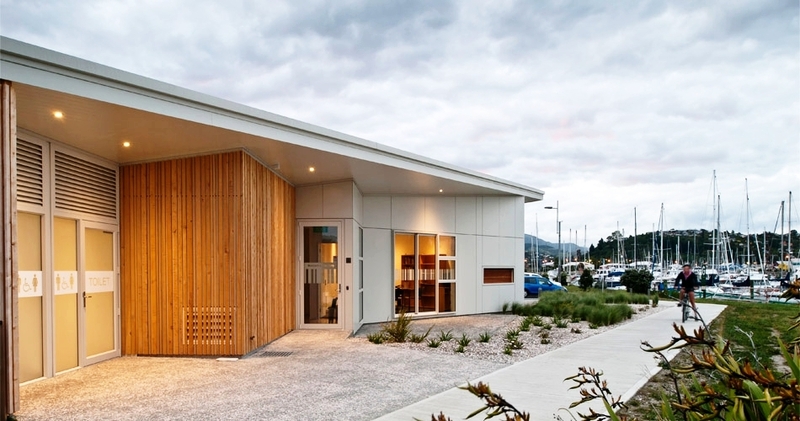 Elsewhere, walls are clad in fibre cement panels, which are dressed in places with macrocarpa as a cost-effective response to improving the material palette.